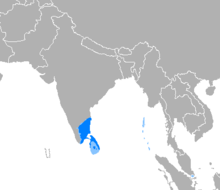 Tamil is one of the longest-surviving classical languages in the world. A. K. Ramanujan described it as "the only language of contemporary India which is recognizably continuous with a classical past." The variety and quality of classical Tamil literature has led to it being described as "one of the great classical traditions and literature of the world". Oppaari song lamenting death, sung by women during a death ceremony. Here it is the death of a son lamented by the mother. Audio recording of Pudumaipithan's short story 'Pon Nagaram' (showing a few loanwords). Literary Tamil in hymn 'Umbartharu' (Hamsadhwani) on lord Ganesha from Thiruppugazh (c. 1400s). 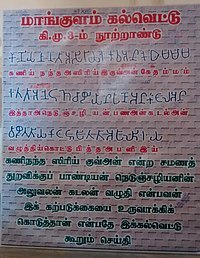 Literary Tamil pronunciation. Reading an excerpt from Ma. Po. Si. 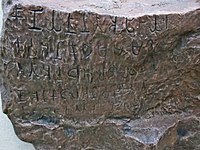 's book 'Arivuk kadhaigal' (1900s). Literary Tamil pronunciation in song written by Subramanya Bharathi, 'Senthamizh naadennum pothinile' (1900s ). கொக்கு நெட்ட கொக்கு. நெட்ட கொக்கு இட்ட முட்ட, கட்ட முட்ட. ஏழை கிழவன் வாழைப் பழத் தோல் மேல் சருசருக்கி வழுவழுக்கி கீழே விழுந்தான்.